Twisted Central: Anchor Bay Buys North American Rights to "Excision"
Anchor Bay Buys North American Rights to "Excision"
LOS ANGELES (chicagotribune.com) - Anchor Bay Films has picked up all North American distribution rights to "Excision", the company said on Tuesday. The horror film made its world premiere at the Sundance Film Festival last month, and if promotional materials are any indication, it is awash in buckets of blood. The film centers on a delusional teenage outcast, Pauline, who engages in such timeless adolescent activities as scab picking and road kill dissection. Those pastimes create friction with her parents and to repair the relationship, Pauline undertakes a risky operation to help her sister recover from cystic fibrosis. 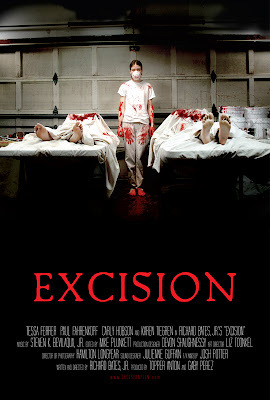 Commenting on the film's extreme violence, fanboy site GeekTyrant wrote, "'Excision' was a extremely disturbing and twisted movie that I can't get out of my freakin' head. There are visuals and images that are now forever burned into my memory, and that's not a good thing." The movie marks the debut feature of writer/director Richard Bates Jr.; Dylan Hale Lewis produced. In addition to Oscar winner Marlee Matlin ("Children of a Lesser God") and Malcolm McDowell, the cast includes a number of small screen names like AnnaLynne McCord ("90210"), Traci Lords ("Cry Baby"), Ariel Winter ("Modern Family"), and Roger Bart ("Desperate Housewives").